A little background information for you. Members of my family operate on their own plane of time. K-time, for example, is generally 20 or so minutes behind the rest of the world. When something needs to be fixed, K-family time dictates that we will be put off until the last possible nanosecond. My dad tried to hang shelves in my childhood room once. He hit some studs, couldn't do it, spackled up the holes and promised to repaint them the next weekend. That was ten years ago. The trunk on my car has been broken for about six months now and every day I say to myself "Jessie, get that fixed this weekend." I mean, what's the point of having a trunk lock that works when you can just pull the back seats down and access it that way? What can I say? The K clan always has, and always will do things in our own time. So when my dad told me to look into getting car insurance in Massachusetts I thought that I had at least six months to get my act together. So imagine my surprise when he insisted that I deal with it immediately. My first thought was, "Is he sick? Is there something wrong with his brain that's making him act out of character?" So that's how I ended up at the RMV for more than four hours today. I wish someone had warned me that everyone in the entire greater Boston area would be at the downtown location since it's the first of the month. I would have brought more snacks and a fifth of Jack to numb the pain. 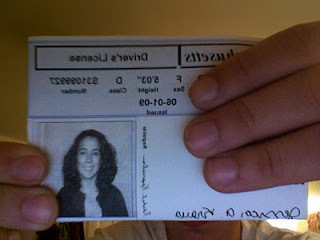 Getting my car registered was pretty painless. I'd say it took about 35 minutes between waiting and filling out the paperwork. Okay, no big deal. I can handle this. The woman informs me that now I have to go to the second floor for licenses. My number is A233 and on my tiny slip of paper. I'm confused when I see that they're currently serving A323 and when I ask, a not so kind gentleman lets me know that the number will go all the way up to 399 and then restart at 200. Then I realize that there are ONE HUNDRED people in front of me on line. Begin irrational anger. While there I see some really interesting people. There's the woman whose skirt was slit up so high that I thought she was planning on flashing her way through the licensing process, the loud breather who keeps asking me for help with his crossword puzzle and the man who with tattoos on both arms including all of his fingers who turns around and says "Your necklace is truly lovely". And how could I forget the woman who pulls half of a rotisserie chicken out of her purse! But people watching only amuses me for so long. And once I finish my book, and my snacks, I am fairly surly. And I'm still about 30 numbers away from my turn. I decide to call my dad and complain. It's a dad's job to share in the suffering of their children. He doesn't pick up, probably because after 25 years he's pretty used to my tricks. Nuts. Finally, FINALLY they call my number. By the grace of God I have managed to bring all of the identification and forms that I need. When she asks me to sign I have some problems. I'd love to know who can produce a legible signature on one of those electronic pads? Had I realized that it was going to be on my license for the next however many years, maybe I would have tried a little harder. She takes my picture and asks me if it's okay. My only response is "Eh, at least it's better than my New York license picture," to which she replies "Yes, that's very true." In my defense when I took my last picture I had MONO and a raging sinus infection that left my entire face and neck swollen. No, I was not drunk when I signed my name. Oh the fun! This reminds me of what I had to go through to apply for my American passport while I was here in Toronto a few years ago. At least it is done and you don't have to worry about it for a long while!